Presentation on March 5th, at 9 pm at Sala Luz de Gas (Barcelona). “Salto al vacío” is the debut album of artist Inma Ortiz, singer, songwriter and communicator, with a sensuality and senstivity that is as special as it isoverwhelming and she has been able to demonstrate this through 12 songs of highly poetic content. “Sallto al vacío” is a declaration of principles, a letting yourself go, fluidity and to bring out those colours in burning sentiment. The album’s songs have a Mediterrean air, where the musical journey that is undertaken has Arabic notes, a certain melancholy of the Portuguese “fado” and the force of flamenco along with the simple and truthful of that music that speaks to all of us and takes it directly to heart. The songwriting in this album talks about the changing processes that reorient us in life, it speaks of love, its loss and our inner landscapes that are written in Spanish, Catalan and Portuguese, transmiting in this way the linguistic richness that exits in the lands around the Mediterranean. “Sallto al vacío” was produced by Xavier Capellas , Inma Ortiz and Jordi Bonell with the collaboration of amazing musicians such as Xavi Turull (percussion), Felipe Andrés Varela (double bass), Vicente Martínez (flamenco guitar), Diego Cortés (flamenco guitar), Mohamed Soulimane: (violin), Marcelo Mercadante (accordian) y Egor Pavyuchenko (flute). And specially to my anonymous mercenaries, because they help was the final and ultimate run, and finally to my family thank you for helping me jump towards this jump into the open! !Thank you Murri!!! Thank you to Luis Miguel Sala and his family for lending their fabulous studio, thank you to Luis Miguel for giving his magical force and for taking such good care of us all. Thank you to y two pillars, Jordi Bonell and Xavier Capellas for their wonderful help and implicitc art in each one of the songs. 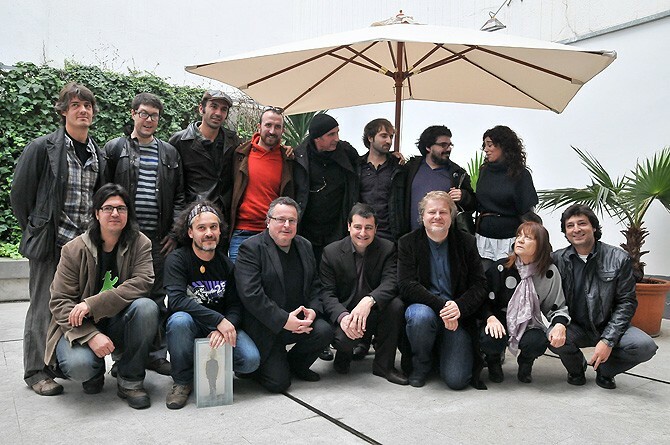 Thank you Jordi Bonell master….. thank you for your art. Thanks to Xavi Capellas the one and only! Thanks to Vicente Martinez, a great friend to collaborate with and lend his beautiful song: “Aire..” thank you Vicente!Thank you Diego Cortes for your virtuosity which is second to none. Thank you to my friend Carlos Torregrossa, its been a pleasure having your voice next to mine!! Thank you Isidro Batlle for your art and amanzing will.. Thank you to everyone from the bottom of my heart! Inma Ortiz, finalista en el IV Certamen de Terra i Cultura amb la cançó "A Mig Aire"